Increases in traffic volume nationwide coupled with growing numbers of road rehabilitation and reconstruction projects are often a recipe for congestion and delays for the traveling public. Two pilot accelerated construction workshops held this past spring in Indianapolis, Indiana, and Pittsburgh, Pennsylvania, looked at innovative ways to accelerate the reconstruction of primary corridors in need of major rehabilitation, all while maintaining quality and safety for the motorist and the highway worker. Sponsored by the American Association of State Highway and Transportation Officials' Technology Implementation Group (TIG), Federal Highway Administration (FHWA), and the Transportation Research Board's (TRB) Task Force on Accelerating Innovation (A5T60), the workshops brought together staff from the host Departments of Transportation (DOTs) and experts from other State highway agencies, industry, academia, and FHWA. These experts' skill areas included innovative financing, long-life pavements, right-of-way, utilities, and innovative contracting, as well as improved work zone traffic control and worker safety. The Indiana workshop, held March 17-19, 2002, focused on a needed improvement to Interstate 465 on the west side of Indianapolis. The corridor improvement calls for adding a travel lane in each direction and modifying eight interchanges on a 19-km (12-mi) stretch of the Interstate. More than 150,000 vehicles a day travel on the roadway, which serves the Indianapolis International Airport and Indianapolis Motor Speedway, among other major traffic generators. Few alternative routes currently exist to reach many of the destinations along the corridor. Following standard practice for reconstruction of the corridor would mean 5-8 years of construction, two to three engineering contracts, and no less than five separate construction contracts, with the Indiana Department of Transportation (INDOT) serving as the lead coordinator for all activities. The challenge under the new accelerated construction concept discussed at the workshop was to see if corridor construction could be completed in 3 years while still maintaining the traffic flow. Recommendations made at the workshop for speeding up the process included letting one corridor design engineering contract, considering one design/build construction contract, and looking at several other phasing and construction options. The contractor would serve as the lead coordinator for the project, if the design/build option was employed. Another important set of recommendations concerned the financing of the project. The team suggested that Indiana consider using Grant Anticipation Revenue Vehicle bonds as the principal financing vehicle for the project, maximize Federal matching tools, and contain costs through such methods as value engineering, among other steps. Other suggestions included employing prefabricated bridge systems, designing a long-life (60-year) pavement, using subsurface utility engineering to obtain better information on utility locations and potential interference, and forming a Right-of-Way, Utility, and Design Team to coordinate issues as early as possible. Accelerated construction efforts would be accompanied by extensive media and public information campaigns to keep motorists informed. INDOT is considering the workshop recommendations as it draws up plans for the project. "The workshop allowed the open discussion of numerous innovative right-of-way, utility relocation, structural design, pavement design, and construction options which may be employed on this project or other INDOT projects in the future," said INDOT Chief Engineer Richard K. Smutzer. "The workshop was definitely a success and very informative for all of the participants." The Alabama DOT found success this year using precast and prestressed concrete girders to accelerate the replacement of a three-span bridge on I-65, which is the main north-south route through Alabama. The bridge had been badly damaged by the crash of a fully-loaded fuel tanker truck in January 2002. Work on the replacement bridge began on February 25 and was completed 37 days later, which was the fastest that any bridge project had ever been completed in Alabama. "Using the precast concrete paid off in a really big way," says Fred Conway, Bridge Engineer for Alabama DOT. The contractor earned $1.3 million in incentives by finishing the project 52 days ahead of schedule. For more information on the Alabama I-65 project, contact Fred Conway at Alabama DOT, 334-242-6007 (email: conwayf@dot.state.al.us). 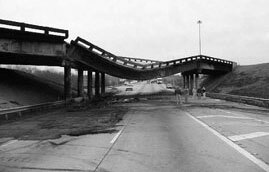 The photo above shows the damaged I-65 bridge. Above is the project site on day seven of the reconstruction. A similar workshop in Pennsylvania, held April 10-12, 2002, looked at options for accelerating the rehabilitation of a 2.8-km (1.8-mi) segment of Pennsylvania Route 28 in Pittsburgh. More than 60,000 vehicles a day use this very compact corridor. Proposed improvements include elevating and dividing Route 28 to accommodate widening the road to four lanes with shoulders and median barriers and providing grade-separated interchanges at two bridges. The Pennsylvania Department of Transportation (PENNDOT) estimates that these improvements could save $11 million per year in user delay costs. Construction challenges faced by PENNDOT include having to work on a tightly confined corridor that is supported by a retaining wall adjacent to railroad tracks along the northbound lanes. Adjacent to the southbound lanes are numerous businesses and residences, as well as several historical landmarks. Another critical aspect of the project will involve relocating existing utility lines, including an 18-m (60-ft) waterline with numerous supply lines, extensive sanitary sewer lines, natural gas supply lines, and electric and telecommunication lines. The goals of the project include completing construction in 2 years (1 year earlier than originally planned), maintaining a traffic flow of 56 km/h (35 mi/h) during construction, and providing a long-life pavement that can last 50 years without requiring major maintenance. Recommendations made at the workshop for achieving these goals again included letting only one design/build contract, moving utility lines off of the corridor, and using multiple, high-speed wall construction teams to build the hillside walls and two of the lanes. A common theme for both workshops was the multi-discipline teamwork approach used in analyzing the corridors. "Major construction efforts are really a team effort, with skills needed from nearly every element of a highway department, everything from bridges, utilities, and right-of-way to geotechnology, constructibility, extended pavement design, worker and public safety, mobility, public relations, and financing, as well as contractor innovations," said Mike Ryan, Deputy Secretary for Highway Administration with PENNDOT and a member of the TRB A5T60 Task Force. "These workshops clearly showed the benefits of having experts work together as a team to come up with solutions that no one individually would come close to considering." TRB, FHWA, and the AASHTO TIG met in July to review reports on the two pilot workshops and to discuss further implementation of the accelerated construction concept, such as holding future workshops or establishing an accelerated construction team. As implementation plans are developed, Focus will provide updates.